Whether it is a winter escape or a holiday visit, there are a couple of wonderful places one can visit in Addis Ababa and make a vacation more entertaining. Depending on your taste, there are a variety of restaurants,cafe's,cinemas and other places to choose from.The following are my picks for top 5 spots for visitors who plan to visit the capital. 1.Cinema - The cinema theater in Edna Mall is noteworthy. The mall is situated closer to Bole international airport and is located in front of the Holy Trinity church.The cinema theater shows latest Amharic and international movies. In addition to movies,there are recreational rooms for children and youth. 2.Cafe - New York Cafe is a favorable pick from this category. They serve hot drinks such as "machiato" and coffee. 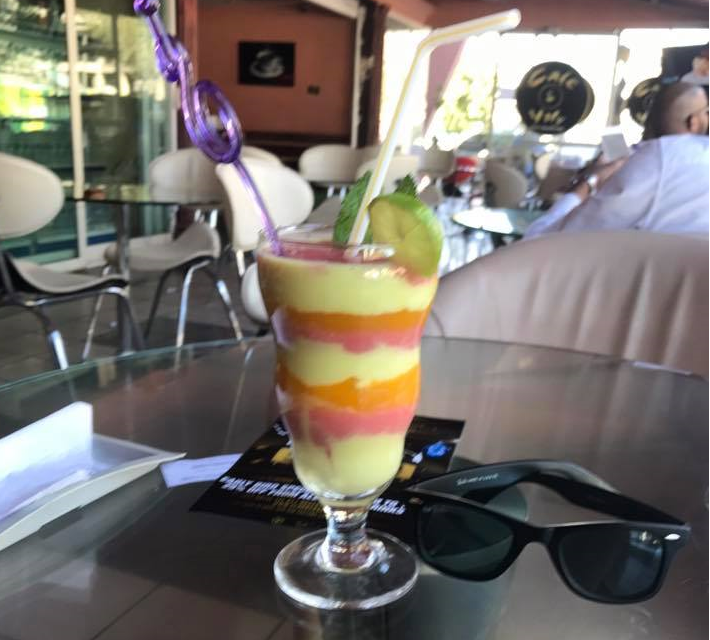 Moreover, for those who are interested in fresh juice, there is plenty to choose from the menu.It's located in "olympia" in front of Getu Commercial Center. 3.Restaurant - There are lots of restaurants in Addis. Also located in Bole, Yod Abyssinia is preferred by many who visit the city,It's probably the best place to taste your long awaited original "tibs" and "doro wot" together with live traditional Ethiopian music and coffee ceremony. 4.Night Life - There are many bars and clubs in the city. 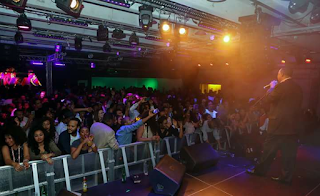 Club H20 is a relatively modern club with good sound and lighting systems. Famous musicians are sometimes invited to sing at the club. 5.Swimming? Most of the months in Ethiopian calendar are warm. So it presents opportunity for outdoor swimming at Ghion Hotel. This pool is international in size and is situated very close to the national stadium. However, if you prefer indoor swimming, you can stop-by at Bole Rock-located just behind Edna Mall. Do you agree ? What is yours ? Leave your comments. Oavsett om det är en vinter fly eller en semester besök, finns det underbara platser man kan besöka i Addis Abeba att göra din semester mer underhållande. Beroende på din smak finns det många restauranger, caféer, biografer och andra platser att välja från. Följande är mina val för topp 5 platser för besökare som planerar att besöka huvudstaden. 1.Film - Film teatern i Edna Mall är underbart. Gallerian ligger närmare till Bole internationella flygplats och ligger framför den Heliga Trefaldighets kyrkan. Bio teater visar senaste Amhariska och internationella filmer. Förutom filmer, finns det förströelse rum för barn och ungdom. 2.Kaffe - New York Cafe är en gynnsam plocka från denna kategori. De serverar varma drycker som 'machiato' och kaffe. Dessutom, för dem som är intresserade av färsk juice, finns det massor att välja från menyn. Det ligger i 'olympia' framför Getu Commercial Center. 3.Restaurang - Det finns många restauranger i Addis. Ligger i Bole, Yod Abessinien föredras av många som besöker staden, det är förmodligen det bästa stället att smaka din efter längtade 'tibs' och 'doro wot' tillsammans med levande traditionell Etiopisk musik och kaffe ceremoni. 4.Nattliv - Det finns många barer och klubbar i staden. Club H20 är en relativt modern klubb med bra ljud och belysnings system. Kända musiker är ibland inbjuden att sjunga på klubben. 5.Simning? De flesta månaderna i Etiopiska kalendern är varm. Så det utgör möjlighet till utomhus simning på Ghion Hotel. Denna pool är internationella i storlek och ligger mycket nära från national stadion. Men om du föredrar inomhus simning, kan du besöka Bole Rock - ligger precis bakom Edna Mall. Vad tänker du om det? Lämna dina kommentarer. 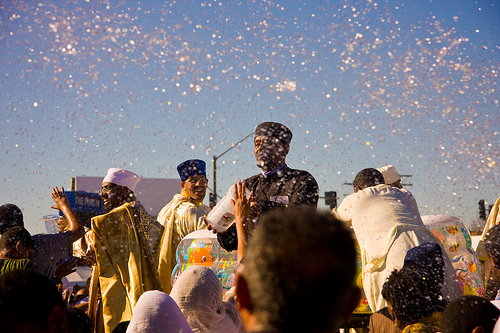 Just like most holidays,the Ethiopian Epiphany is celebrated with a dazzling ceremony. In Amharic, the term is coined as "timket". It is the holiday that is commemorated eleven days after Christmas. 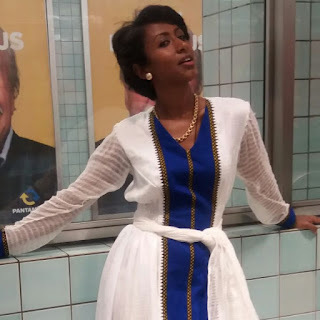 In Ethiopian orthodox churches, the holiday has a special ceremony. It's a religious tradition whereby "tabot" - a sacred item that belongs at the church, will come out of the usual place and stays for a night or so at an open area inside a tent. People from different areas come to that location for spiritual prayer and songs- most spending the night until dawn. In the morning after the ritual prayer, there comes a time where people drink and sprinkle on their faces "tsebel", a holy water used to symbolize baptism. 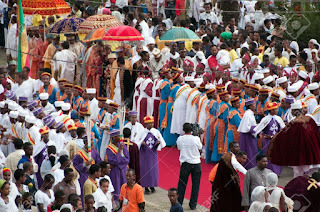 After this the "tabot" will start heading back to the church while the crowd accompanies it.This is a memorable event that should be seen by people who are interested in Ethiopian culture. Precis som de flesta helgdagar är den Etiopiska Epiphany firas med en bländande ceremoni. I Amhariska är termen kallas som 'Timket'. Det är den semester som firas elva dagar efter jul. I Etiopiska ortodoxa kyrkor, har semester en särskild ceremoni som 'Meskel'. Det är en religiös tradition i vilken 'tabot' - en helig objekt som finns hemma i kyrkan, kommer att komma ut av den vanliga platsen och stannar för en natt eller så på ett öppet område i ett tält. Människor från olika områden komma till platsen för andlig bön och sångs mest övernattning fram till morgonen. På morgonen efter den rituella bön, det kommer en tid där människor dricker och strö på deras ansikten 'tsebel', ett heligt vatten som används för att symbolisera dop. Efter detta tabot börjar på väg tillbaka till kyrkan medan publiken åtföljer den. Detta är en minnesvärd händelse som bör ses av personer som är intresserade av Etiopiska kulturen. There were few talking points at the concerts held in Alvik and Globen. Both of the concerts have attracted many fans in Sweden. In the concert hall of Alvik where Abdu sang, some were disappointed with the temperature settings of the venue.There were no ventilation system inside and most were sweating. Furthermore, some people were asked to pay with cash or Swish only. As a result, this led to unusual line at the ATM line closest to the hall not to mention the time it took as an additional obstacle. 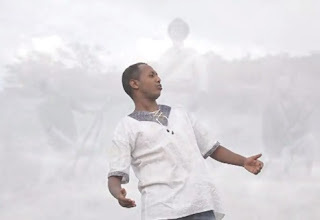 It has also been observed that, this was the case in Ephrem's concert. It would have been favorable if fans knew the method of payment at the door beforehand. 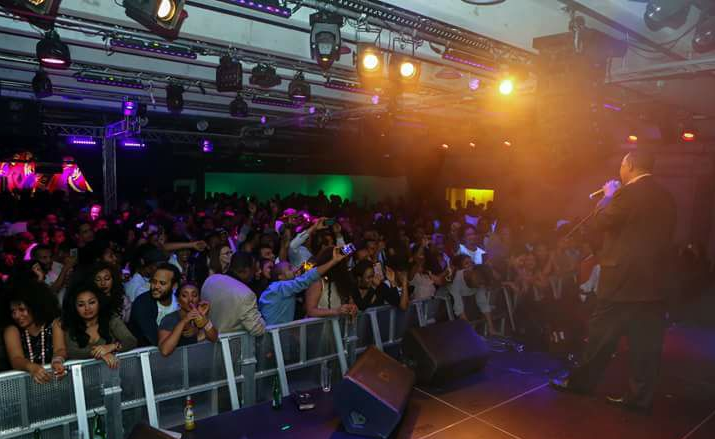 In Ephrem's concert, few people were returned after they heard that the concert arena were full. Some of these fans said prices to entrance were going up. It was the opinion of some that, it could have been better if online ticketing system were applied since there were audiences who arrived from another city to participate at the event. The venue at Globen were better in terms of design and sound system compared to the one in Alvik while the price of beverages were better at the latter. Apart from minor incidents, there were no disturbances at the stage where the musicians presented their work. Overall, many were entertained at the concerts with few room left for improvement. Were you there? What's your opinion? On the other hand, there are speculations that the next musicians to arrive at the capital are Lij Michael and Madingo Afework. 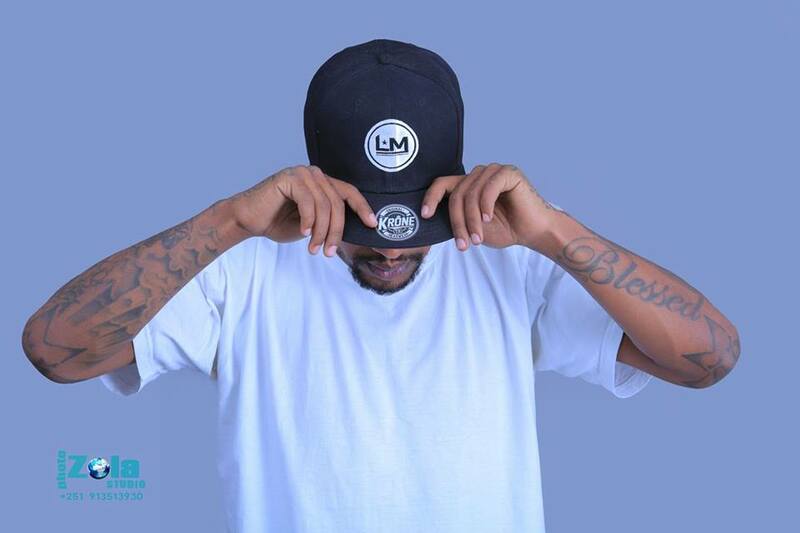 Lij Michael has been popular for integrating hip hop style music to Ethiopian songs. The title "Zemenay mariye" has been a hit song and favored by many. He's currently working on a new song together with Sami-Dan. The name of the song is entitled, "Ayzosh". On another note, Madingo has published his latest album labelled "Swedilat" two years ago and has got a lot of admiration. In an interview with a radio station in Addis Ababa, popular artist Teddy afro has applauded the album specially the song "godanaw godanaw (Yearategnaw Tatsh )". Det fanns några samtals ämnen på konserterna hölls i Alvik och Globen. Båda konserterna har lockat många fans i Sverige. På concert hall i Alvik där Abdu sjöng, blev några besvikna med temperatur inställningar av arenan. Det fanns ingen ventilationssystem och de flesta var svettning. Dessutom, uppmanades vissa människor att betala med kontanter eller Swish bara. 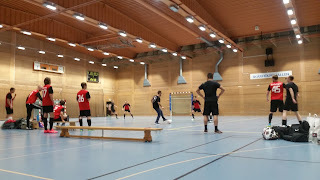 Som ett resultat, ledde detta till ovanliga linje vid ATM linjen närmast hallen. Det har observerats att detta var också fallet i Ephrem's konsert. Det skulle ha varit gynnsamt om man visste betalningsmetoden vid dörren i förväg. I Ephrem's konsert, få människor returnerades när de hörde att konsertarenan var fulla. Några tycker att det kunde varit bättre om online kö system tillämpas eftersom det fanns publik som kom från en annan stad att delta på evenemanget. Den plats i Globen var bättre när det gäller design och ljud system jämfört med en i Alvik medan priset på drycker var bättre på den senare. Förutom mindre incidenter fanns det inga störningar i skedet där musikerna presenterade sitt arbete. Sammantaget många blev underhållna på konserterna med några rum kvar för förbättring. Var du där? Vad är din åsikt? I andra sidan, det finns spekulationer att de nästa musikerna att anländer till huvudstaden är Lij Michael och Madingo Afework. Lij Michael har varit populärt för att integrera hip hop stil musik till Etiopiska låtar. Titeln 'Zemenay mariye' har en hitlåt och gynnas av många. Han arbetar för närvarande med ett nytt album tillsammans med Sami-Dan. Namnet på albumet är "Ayzosh". På en annan not, Madingo har publicerat hans senaste album märkt "Swedilat" för två år sedan och har fått en hel del beundran. I en intervju med en radio station i Addis Abeba, har populära artisten Teddy afro applåderade albumet speciellt den låten "godanaw godanaw (Yearategnaw Tatsh)". Unlike the Gregorian calendar, the Ethiopian Christmas which is commonly referred as "genna" come to pass on January the 7th. The holiday is celebrated by Christians around the country with vibrant ceremony. 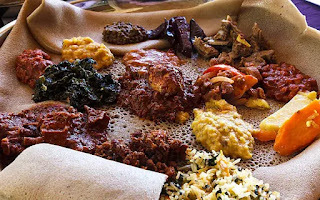 Just few days earlier before the holiday, it's common to see large crowd around open market places looking to purchase items and food supplements to make the day delightful and prepare traditional Ethiopian cuisine. Contrary to the Swedish Christmas day where it takes place in the colder period of the year, "genna"- rather come to pass at the warmer period of the year in Ethiopia. From my experience, giving each other gifts for Christmas and having a dinner table are the highlights of the holiday in Sweden whereas that's is not the case in Ethiopia although parents mostly purchase new clothes for children. The most memorable moment from the holiday would be when everyone gathers around and dine together. In addition, the coffee ceremony makes it more entertaining. Traditional alcoholic drinks such as "tela" and "tej" are also common parts of the ceremony. Most of the Ethiopian churches in Stockholm celebrate the eve of the holiday with spiritual prayer and spiritual songs. If you are interested in attending the event, you can do so by visiting one of the churches in Hötorget,Nacka or Hagsätra. Therefore, if you are to witness women dressed in white clothing around the metro or bus stations in Stockholm on January 7, it is safe to assume that they are either going to the church or returning back to their home. Merry Christmas and what are your impressions of the holidays ? Till skillnad från den Gregorianska kalendern, kommer den Etiopiska julen som kallas vanligen 'genna' att passera på den 7 Januari. Semestern firas av kristna runt om i landet med pulserande ceremoni. Bara några dagar tidigare innan semestern, är det vanligt att se en stor folksamling runt öppna marknadsplatser som funderar på att köpa objekt och kosttillskott gör dagen förtjusande och förbereda traditionell Etiopisk mat. Motsatts till Svenska juldagen där det sker i den kalla perioden av året 'genna'-snarare kommer att passera på den varma perioden av året i Etiopien. Från min erfarenhet, ge varandra gåvor till jul är höjdpunkten av semestern i Sverige medan det är inte fallet i Etiopien trots att föräldrar oftast köpa nya kläder för barn. Det mest minnesvärda ögonblicket från semestern skulle vara när alla samlas runt och äta tillsammans. Kaffe ceremonin gör det ännu mer underhållande. Traditionella alkoholhaltiga drycker kallas som 'tela' och 'tej' är också gemensamma delarna av ceremonin. Mest av de Etiopiska kyrkorna i Stockholm firar strax före semestern med andlig bön och andliga sånger. Om du är intresserad av att delta i evenemanget, kan du göra det genom att besöka en av kyrkorna i Hötorget, Nacka eller Hagsätra.